The Senate, through its committee on Judiciary, Human Rights and Legal Matters, on Tuesday, issued a fresh summon to the Attorney – General of the Federation, who is also the Minister of Justice, Mallam Abubakar Malami. Malami was being invited by the senate for instituting a forgery case against the presiding officers of the upper chamber, and two top management staff of the National Assembly. The senate had first summoned Malami, following a motion moved by Senator Dino Melaye, representing Kogi West Senatorial District, who relied on order 14 and 52, to demand the approval of his colleagues for his two prayers including the invitation of the AGF and the genuineness of the rule book. The senate, had approved the two prayers through voice votes while Deputy Senate President, Ike Ekweremadu, who presided over the session, asked the Judiciary, to summon Malami, within 48 hours and interrogate him on the issue. The red chamber therefore mandated its panel to within two days summon the AGF to explain and justify with evidence the basis for his action. The senators also wanted the committee to find out from Malami to tell them, whether his action did not constitute gross misconduct, incompetence, contempt of court and abuse of office. 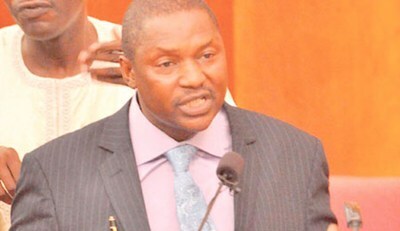 Malami, did not honour the invitation of the senators last week Thursday, but sent a letter to the committee, stating his reasons for his absence. The senate panel in its fresh summon dated June 27 and signed by its Chairman, Senator David Umaru, asked Malami to appear before it on Thursday, by noon. “I write with reference to your (AGF) correspondence on the above subject matter with Ref. HAGF/NASS/ZOIG/Vol.1/24, dated 23rd June, 2016, whereby you requested for an adjournment of the meeting of the Committee, which was supposed to hold on Thursday, June 23, 2016, to enable you prepare your response. “The Committee has considered your request and having regard to the reason adduced, acceded to the request for an adjournment. “Accordingly, the meeting is now scheduled to hold on Thursday 30th June 2016 at 12 noon prompt. The senate at plenary on Tuesday, after a two-hour closed session, summoned Malami, over the planned prosecution of Saraki and Ekweremadu, for allegedly forging the Senate Standing Order 2015.